American great soulmen Ray Charles, Stevie Wonder and Marvin Gaye have an heir. He is 26, French and is pretty darned retro. His name ? Ben L'Oncle Soul ! The Tours-born artist has proved with his first eponymous album that soul music is not only an Anglo-Saxon business. An idea that was certainly reinforced after the standing ovation he received at the end of his gig at the Pigalle Club. Ben L'Oncle Soul is definitely audacious. He made his name in 2009 with his first of six-covers Ep 'Soul Wash', including the much-broadcast cover version of Whites Stripes 'Seven Nation Army'. But why the name 'Soul Wash' ? As he explained to me, he puts random songs into a sort of 'washing machine' which transforms them into soul hits. Nice metaphor isn't it ? A proof of this soul-cleaning brilliance is the inimitable cover version of Aqua 'Barbie Girl'. Barely recognizable, this exasperating 1997 dance song turns into a memorable soul hit. You have to listen to it to believe it. But don't believe that Ben is just an expert in cover versions. His first eponymous album Ben l’Oncle Soul (2010) was also a Top Five hit on the French albums charts. If you listen to his songs in French - 'Soulman', 'Petite Soeur' – as well as in English - 'Back for You', 'Lose it' -, you just can't but let yourself get caught up in the passion and energy. Tasteful and well-made, the songs are full of trumpets, guitars and drums, but all you really hear is that voice - hovering between Ray Charles and Otis Redding, between rage and gentleness, between mournful and ecstatic. Years before he became famous, Ben got his musical start as a vocalist in a Gospel Choir, which he joined in 2004. This may give explanation to his 'warm' groove which dramatically enthralled the audience at the Pigalle Club. In the non-existent French soul scene, Ben's prophetic irruption is almost a miracle. Just consider this : a French artist signed by the Motown label – the one which produced Stevie Wonder and Marvin Gaye. That seems unbelievable. However, between the label and the artist, it is a true love story. Ben has had the name of the legendary label tattooed on his wrist. An elegant way to thank Motown for having entrusted him to be the figurehead of French soul. 'I am the French department of the label' he told me. Hard to disagree. Everything – from his look to his musical influences – pays tribute to the golden age of the 'soul sixties'. Ben l'Oncle Soul, with his bow tie and braces giving him this outdated but lovely idiosyncratic style, seems to be trapped in the 1960's. An enchanting trap. The truth is that he is just what we like in a soulman — a powerfully voiced unique guy who loves stately soul ballads, as is the case in his song 'Soulman'. More ground for satisfaction : his on-stage performances. Ben L'Oncle Soul is a real showman. Again, it is hard not to see through Ben's gig the frenziedly paced performances of his soul idols. Indeed, thanks to the odd and hilarious choreographies in a Temptations-like style, the concert's pace became furious as the night went on until the Pigalle Club was transformed into a wild dance hall. As the audience turned completely 'crazy' during his cover version of Gnarls Barkley's hit, the definition of 'soul music' he gave me during our interview sprang to mind: 'it is all about energy and emotions'. 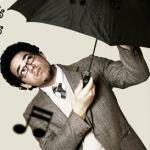 Energy and emotions : this is why Ben L'Oncle Soul is a soul master. Let's hope it lasts ! Ben l'Oncle Soul, un génie de la Soul française !